It is the end of the year, and very soon, you will have to think about celebrating with friends and/or family, and if not done already, start to plan the food and beverages for your parties whether at home or invited elsewhere. Generally, in these festive times, what comes to mind is very often the noise of a cork popping up from a bottle of bubbly jealously chosen or kept for these special occasions. However, due to the recession and lack of motivation to spend a lot of money, unable to foresee the immediate future of the next 3-6 months to come, people in general will surely be more cautious this year than any previous year. They will surely spend less, but they will spend a little bit still. It is in our nature. Humans tend to celebrate whenever they can, which lately doesn’t happen so often, or let say, less often compared to a few years ago. Yet, we need these moments of joy around family and friends. It important. It is tradition. It is a good excuse. Therefore, people in general will search for very good values, as the last 6-9 months have demonstrated huge increases in sales for still wines under $15 and sparkling wines under $25-$30. Yet, it seems that Prosecco, Cava, Crémant and other sparkling wines under $20, are now more subject to particular attention from the customers. Therefore, always in my quest to introduce you to lesser known regions, producers and wines at excellent value, I would like to introduce you to a delightful sparkling wine from the Languedoc: Crémant de Limoux from Toques et Clochers (Sieur D’Arques). Sieur d’Arques is a winery recognized and often prized for its excellent Blanquette de Limoux wines. But what is Blanquette de Limoux? Blanquette de Limoux is a fairly crisp, friendly and delightful sparkling white wine produced around the city of Limoux, about 26 kilometers southwest of the magnificent medieval town of Carcassonne, in the southwest of France, near the “Pyrénées Orientales”. Neighbor to Corbières and located in the northwestern part of Roussillon and western part of the Languedoc, this appellation is often considered part of the Languedoc area. The name Blanquette de Limoux has been used for a long time for the sparkling wines from Limoux. "Blanquette" actually just means "white" in the local Occitan language. Blanquette de Limoux can contain three grape varieties: Mauzac, which must constitute a minimum of 90% of the wine, Chardonnay and Chenin Blanc. Prior to the 1990 introduction of the Crémant de Limoux AOC, the use of Mauzac was optional. The change to the mandatory minimum of 90% Mauzac in the AOC regulations of Blanquette de Limoux was seen as a safeguard in maintaining the traditional style of Blanquette de Limoux and preserving the use of the local Mauzac grape which is declining in worldwide plantings. The taste of this Mauzac based wine is unique, with apple flavors and distinctive aromas of fresh cut grass that can be identified in blind tastings. The grape varieties are vinified separately before being assembled and bottled. Just before bottling, a liqueur de tirage is added to the blend so that a second fermentation will take place in the bottle. The carbon dioxide produced during this second fermentation is trapped in the bottle and gives the wine its effervescence. After nine months, the bottles are opened and disgorged before a final corking. And what is Crémant de Limoux? When the term Crémant was introduced for non-Champagne sparkling wines in France, an AOC for more "modern" (or internationally styled) sparkling wines, was created in 1990. The origin of that decision occurred a year earlier, in 1989, when the producers of Limoux had to decided on whether or not they wanted to maintain the traditional makings of Blanquette de Limoux based on Mauzac or relax the AOC regulations to allow the introduction of more Chenin blanc and Chardonnay to create internationally recognized flavors. Limoux producers were split on what direction they wanted to go, so the provisional appellation of Crémant de Limoux was introduced to allow the producers to make whichever style of sparkling wine that they preferred and still sell it under an AOC designation. A deadline was set in 1994 for the least used AOC designation to be phased out but the deadline passed without Crémant de Limoux or Blanquette de Limoux making significant progress and both AOC continue to co-exist today. These Crémant de Limoux wines differ primarily from Blanquette de Limoux in their grape composition with Chardonnay and Chenin Blanc as the main varieties. Together they are not to exceed 90% of the wines. For Chenin blanc, a minimum of 20% and a maximum of 40% must be used. Mauzac and Pinot Noir are accessory grape varieties and may not exceed 20% together with Pinot Noir itself not exceeding 10%. Thus, Crémant de Limoux contains 40-70% Chardonnay, 20-40% Chenin Blanc, 10-20% Mauzac and 0-10% Pinot Noir. AOC regulations dictate that the wine must be aged for a least a year on the lees prior to disgorgement. Over 40 villages around the city of Limoux are permitted to make Crémant de Limoux. Sieur d’Arques is a winery located in the western part of the village of Limoux, on the avenue du Mauzac (which is the name of the main grape variety used for the production of Blanquette de Limoux). The History of the Languedoc vineyard dates back to the 5 th century BC when the Greeks first introduced grape vines and their cultural practices. It was in 1531, one century before Dom Pérignon, that wines from Limoux stepped onto the world stage thanks to Benedictine nuns from the St Hilaire Abbey, a neighboring village, who created the first sparkling wine in the world: La Blanquette de Limoux. The earliest written references to Blanquette de Limoux can be traced back to the lord of the region, “le Sieur d’Arques” who swigged down “flasks of Blanquette” to celebrate his victories. Four centuries later, in 1946, the founding winemakers of this winery christened their wine, Sieur d’Arques. Situated at the crossroads between two climatic influences, the Limoux terroir is rich in diversity. The enologists and winemakers of Sieur d’Arques, pioneers in parcel-based terroir selection, have taken the full measure of this invaluable diversity. For over twenty years, they have been committed to an innovative, quality-focused approach highlighting four major Terroirs and selecting only those plots for which the micro-climates, soils, topographies and elevations are suited to the production of healthy, ripe grapes. Hence, to the east, the Mediterranean influence produces a dry, hot climate. To the west, the temperate climate is due to the influence of the Atlantic, which guarantees both optimal sun and enough rain all year. In the center of the appellation, the two influences merge, while a cooler climate dominates in the south closer to the Pyrénées. To this must be added the mainly limestone clay soil and vineyards spread out from 200 to 500 meters elevation. These are the essential characteristics of a land full of promise ideal for crafting innovative wines. Les Vignerons du Sieur d’Arques have optimized the exceptional diversity of their 2800 hectares of vineyard to produce supremely delicate, elegant sparkling wines, great white Chardonnays and racy reds highly characteristic of this singular Terroir. 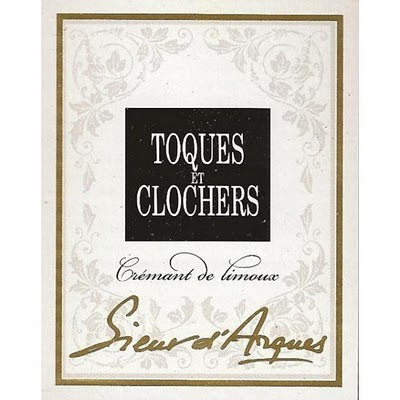 Since 1990, this identity, unique in France, has distinguished the excellence of wines and winemakers of Sieur d’Arques in Limoux. With its four Terroirs and forty two Church bell towers, Limoux benefits from an exceptional situation in Languedoc symbolized by the Toques & Clochers auction, held every year, that continues to inspire the winemakers to give the best of themselves to produce exceptional wines. Made from a blend of Chardonnay, Chenin and Mauzac, this crémant (or sparkling wine) is the product of grapes carefully selected at each step of production. It shows a pale yellow color with green reflects and delicate, refined bubbles. The nose is quite expressive, clean and fresh, dry, with aromas of white flowers and white core fruit intermingled with white blossom notes and slightly toasted, brioche hints. Nice, delicate and focus, the palate is bright and lively offering the same white flowers and core fruit flavors. The finish is inviting and warm with yeasty, toasted notes along with brioche and spicy hints. A delicious, versatile sparkling to enjoy for any occasion. It is a sure value under $20. The delicacy of Chardonnay greatly contributes to its elegance and harmony. Recognized by top Sommeliers and wine boutiques, this sparkling wine will marry most refine dishes. Step into the Green! Drink more Biodynamic, Biologique and Organic wines and spirits and food) from sustainable culture and respect the environment! Support the right causes for the Planet and all the people suffering all around the globe! Also follow projects and products from the Fair Trade, an organized social movement and market-based approach that aims to help producers in developing countries obtain better trading conditions and promote sustainability. Also support 1% for the Planet, an alliance of businesses that donate at least 1% of their annual revenues to environmental organizations worldwide. "Commerce Equitable" or "Fair Trade" is evidently and more than ever a needed movement connecting producers and customers, to be aware of others and their cultural and traditional products based on high quality, natural components and craftsmanship.